“Look, sugar, you know how much I enjoy being with you, but we need to stop this before… well, we just need to stop it.” Marnie turned her back to Lars because it was too hard to see the surprise and hurt on his face at her words. She’d encouraged him to be friends but she knew she needed to keep him at a distance. Her dream of experiencing a happy future with him was just that – a dream. The more time she spent with him, the harder it was going to be when he came to his senses and set his attention on some decent girl worthy of his love. 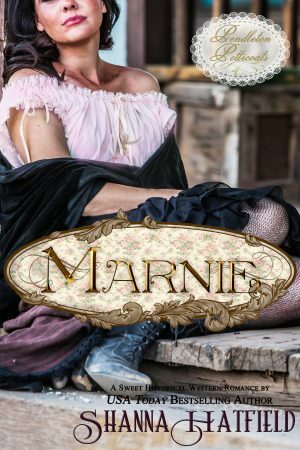 “Stop what?” Lars got to his feet and stepped behind Marnie, placing his hands on her shoulders, pulling her back against him. He breathed in her fresh, clean scent, not yet marred by the cloying perfume she wore when she was working. His breath stirred the tendrils of hair escaping the confines of the hairpins holding her tresses on top of her head. Sliding his hands down her arms, he wrapped them around her waist and allowed himself the luxury of holding her close. “This,” Marnie whispered, her voice laced with misery as her legs began to tremble. She’d never, in her life, felt so cherished and cared for as she did at that moment with the arms of the man she loved holding her close. “What if I don’t want to stop this? What if I want more than this?” Lars leaned down so his warm breath blew across her neck below her ear. He felt the tremor that passed over her as she closed her eyes, fighting against the emotions he knew he stirred in her. He turned her around and pushed up her chin until she met his gaze. Her stormy blue eyes raged with an inner battle as he drew a finger along her jaw and across her chin before tracing the outline of her mouth. When her lips parted slightly, Lars knew he was so far gone for the woman, there was no point of return. Blocking out thoughts of her profession, how wrong it should feel to have such an intense affection for her, he succumbed to his need to taste her, to hold her.